"They did not come from a place of hate," James Charles said in a video apology. "They came from me being a really ignorant 13-year-old who should not have had a Twitter account." Last year, 18-year-old James Charles became the first male ambassador of CoverGirl and instantaneously gained a national platform. James has over 300K followers on Twitter and users combed through over five years worth of his tweets to discover he had made offensive, mocking comments about minorities on more than one occasion. 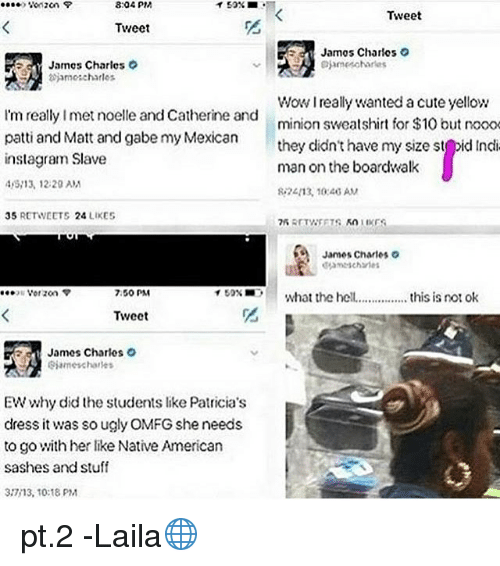 In one screenshotted tweet from 2013, James referred to his friend as his "Mexican Instagram slave." And this past February he tweeted: "I can't believe we're going to Africa today omg what if we get Ebola." After facing a barrage of criticism, James recently posted a video in which he specifically apologizes to people of color, saying, "I have never really made a direct apology to the people that my tweets affected, which is where an apology should've been directed in the first place." CoverGirl never issued a statement on James's ebola tweet. Instead, the brand tweeted a video of him hugging Zendaya shortly after and promptly deleted it after people complained. Numerous Twitter users have said that they will no longer buy CoverGirl products because of James's and CoverGirl's tone-deafness. One user tweeted at CoverGirl, "By allowing him to be on your campaign, I personally feel the company reflects these same stereotypical thoughts." The lack of concrete action from CoverGirl is part of a wider problem within the beauty industry. People of color are held to a much higher standard than white people when they are the faces of brands. For example, Munroe Bergdorf, a trans model, was swiftly dropped by L'Oréal when she posted on Facebook after the violence in Charlottesville, writing "all white people are racist." Days later, L'Oréal announced it had ended its partnership with Munroe. "L'Oréal champions diversity," the company posted on Twitter. "Comments by Munroe Bergdorf are at odds with our values and so we have decided to end our partnership with her." And Lola Ogunyem, a black model who appeared in a recent Dove campaign, felt the need to speak up after the campaign, which featured her washing her face and turning into a white woman, was met with criticism. "If I had even the slightest inclination that I would be portrayed as inferior, or as the "before" in a before and after shot, I would have been the first to say an emphatic 'No,'" Lola Ogunyem told The Guardian. There have also been numerous instance of racism from beauty vloggers this year — yet rarely do they face consequences for their insensitivity. After fans dug up tweets of beauty vlogger Jeffree Star using the n-word, Kim Kardashian posted a video telling fans to "get over it." Of course, the internet was not here for it and Kim quickly took back her words after listening to fans and admitted she "did not know enough about the situation" before commenting. It seems like James has done quite a lot of listening too. He fully owned up to his mistakes. "They did not come from a place of hate," he said. "They came from me being a really ignorant 13 year old who should not have had a Twitter account." And as much as the tweets were disrespectful, it's important to note that no one comes out the womb quoting Malcolm X and fighting for social justice. It's often a learning process. "I've learned so much as a person since then, and I'm not the same person today as I was five years ago." But that does not eliminate the dire need for greater respect for people of color and genuine diversity within the beauty industry. Because we're not just props. Companies must realize that diversity goes beyond how you look or your personal identifications. It's also about the values you uphold and promote to the world. Check out James's apology below. "James Charles’ tweet does not represent CoverGirl’s perspective. We agree his statements were inappropriate but appreciate that he has issued an apology. We are an inclusive brand and respect all people and cultures."